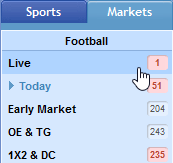 Sports events offering live betting are highlighted in red under the Sports and Markets menu tabs in the left panel. You may also view all live events under the Live Sports tab in the top panel after signing in. In the odds display page, you can tell that an event will be offered live if "Live" is indicated below the kickoff time. Non-live events will only indicate the kickoff time in the odds display page.